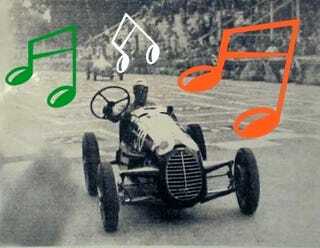 Would you care to sing along to the lyricized exploits of the greatest racing driver who has ever lived? The 1976 Italian pop song Nuvolari might just be the answer to your needs. When not racing his Alfa Romeo P3, giving the Germans a bloody nose at the Nürburgring or taking photographs, Tazio Nuvolari—or rather, his spirit turned muse—was an inspiration for pop. The greatest hit on Italian singer-songwriter Lucio Dalla’s 1976 album Automobili is named after the great man in the yellow sweater. his muscles have muscles exceptional! The birds lose their wings in the air as it passes Nuvolari! “The birds lose their wings in the air as it passes Nuvolari!” Brilliant, brilliant stuff. And now it’s time to sing along!